Spring has officially sprung in the Northern Hemisphere and NASA is celebrating with a dazzling new view of the Earth from space today (March 20). 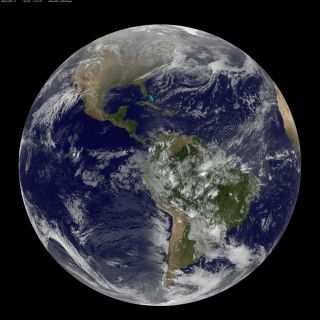 The GOES-13 satellite operated by the National Oceanic and Atmospheric Administration (NOAA) captured the sunning view of Earth from space as our planet reached its vernal equinox — the date that marks the shift from winter to spring in the Northern Hemisphere. In the south, summer changes to fall today. The vernal equinox is a milestone in the Earth's year in which the sun appears to move from south of the celestial equator to the north. During that event, the days — which have been steadily growing longer since the winter solstice on Dec. 21 — are now equal in length to the nights. In fact, the word equinox is Latin for "equal nights." From March 20 to June 21 (which will mark the summer solstice in the north), the days will grow longer as the sun moves higher into the sky, allowing more hours of daylight. That means that, for the Northern Hemisphere, warmer weather is coming after a particularly bitter winter. "Today's vernal equinox marks the first day of Spring in the Northern Hemisphere!" officials at NASA's Goddard Space Flight Center explained via Twitter today. On Sept. 22, the seasons in the north will shift from summer to fall during the autumnal equinox, leading back to winter again. Of course all of this is reversed for the Southern Hemisphere. Today, the seasons change from summer to fall, with the southern spring beginning on Sept. 22. Email Tariq Malik at tmalik@space.com or follow him @tariqjmalik and Google+. Follow us @Spacedotcom, Facebook Google+. Original article on Space.com.